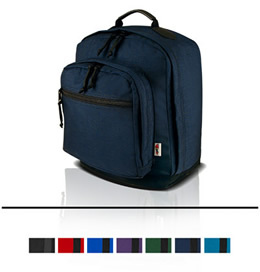 The Nomad's oversized design allows students to carry the extra large load. A huge main compartment, large front pocket, and zippered slip pocket provide ample room for all your gear. A centered, load balancing leather, padded handle provides for easy off-shoulder handling. The main zippers are protected from the environment by weather flaps, straps are padded and adjustable, and the base is reinforced with an extra thickness of CorduraTM Nylon.